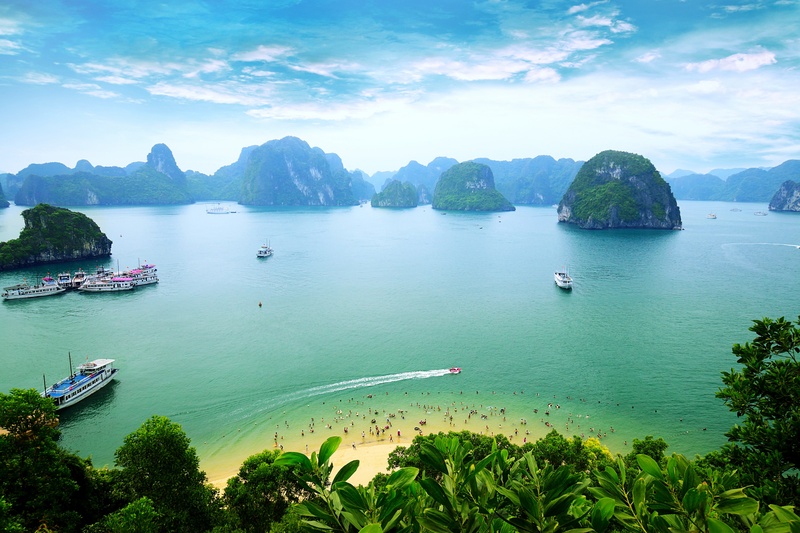 Enjoy 1 night on a cruise Halong Bay. 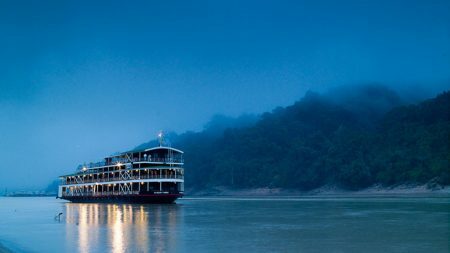 Cruise down Mekong River on a sampan boat and get authentic local experience at artisanal villages. 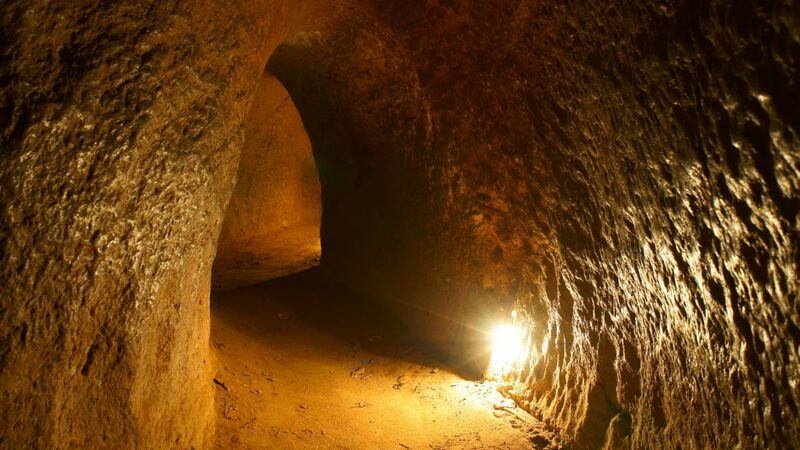 Explore the traces of war at Cu Chi Tunnels. 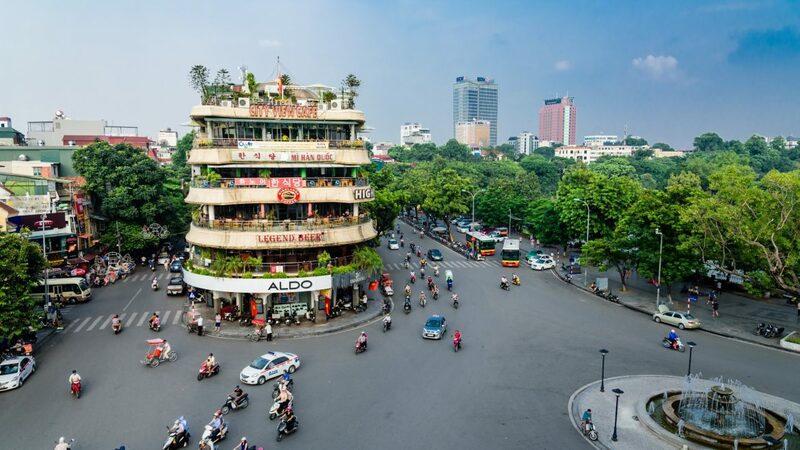 Welcome to Hanoi, Vietnam’s capital! Upon arrival at the Noibai airport, you will be met and transferred to your hotel for express check-in. The rest of the afternoon is at leisure. 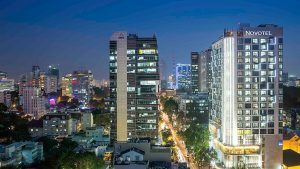 Tonight, enjoy a welcome dinner at Ly Club- the fine dining authentic Vietnamese restaurant. 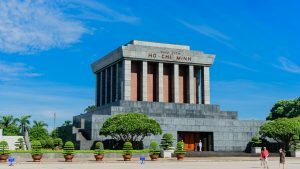 Following breakfast at the hotel, we take a city tour of Hanoi and will explore its main attractions such as the Temple of Literature, Vietnam’s first university and Ho Chi Minh Complex (Ho Chi Minh Mausoleum, One Pillar Pagoda). This afternoon, we invite you to choose one of the following tour enhancement to enjoy. 1. Bat Trang Ceramic Village. 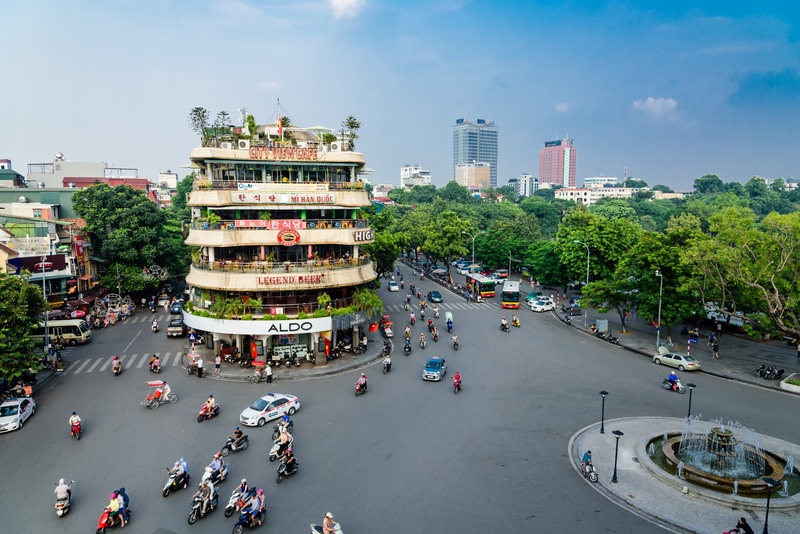 This evening, join us on a Hanoi Street Food tour which offers you a great insight into the local lifestyles. 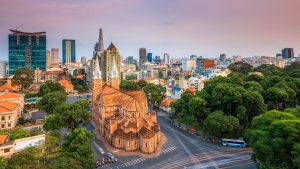 You’ll walk around the selective streets in the Old Quarter, the heart of charming Hanoi, while having a taste of Northern Vietnamese delicacies such as stuffed pancake, Banh My, stuffed sticky rice balls, the unique egg coffee and many more. This is truly the best local touch. Following breakfast at the hotel, journey Southeast to Hoa Lu which had been the imperial capital of many dynasties in history. 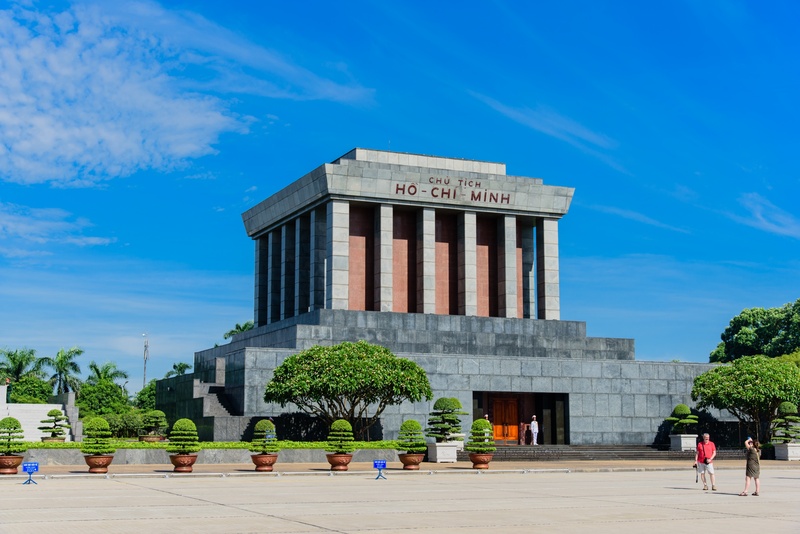 Thanks to the natural advantages, the citadel was built in the location that is surrounded by mighty mountains and deep water, which was considered to be the “Great Wall” of Vietnam. On arrival in Hoa Lu, start exploring the ancient kingdom with thousand-year-old buildings. 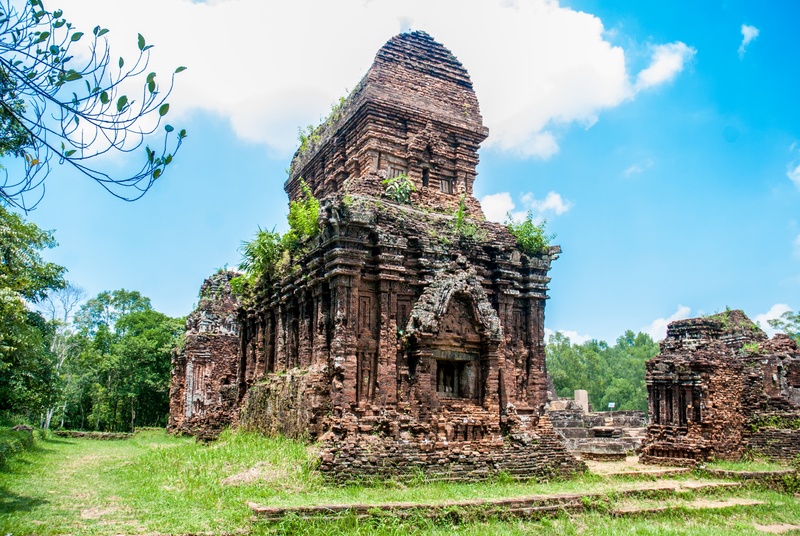 Visit the famous temples worshipping the kings of Dinh & Le Dynasties before proceeding to Tam Coc. 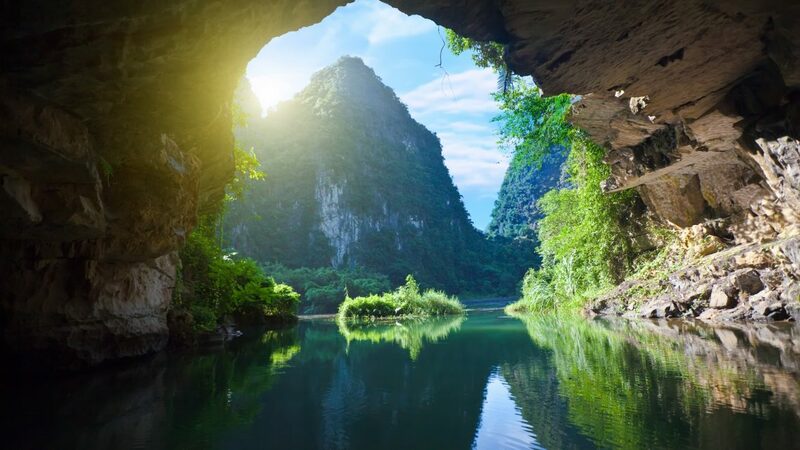 Once you get there, enjoy your lunch before embarking on a boat trip to witness the exquisiteness of the karst formations and caves. We will travel back to Hanoi in the late afternoon. 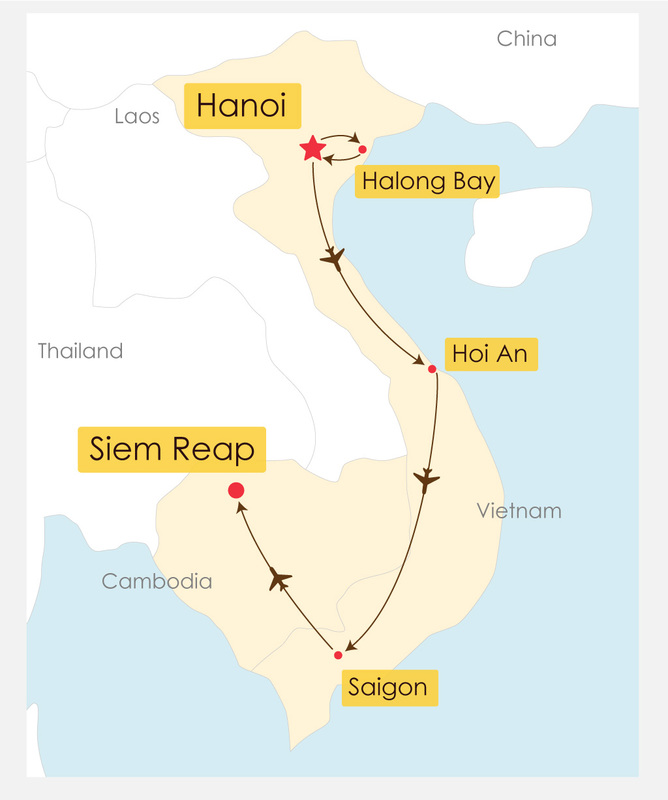 Today you will travel by coach through the rich farmland of the Red River Delta to Halong Bay. 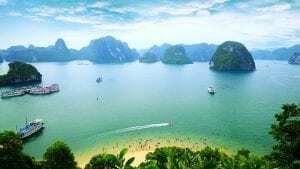 Recognized as a World Heritage site by UNESCO in 1994, Halong Bay’s spectacular scatter of islands, dotted with wind-and-wave-eroded grottoes, is a vision of ethereal beauty. 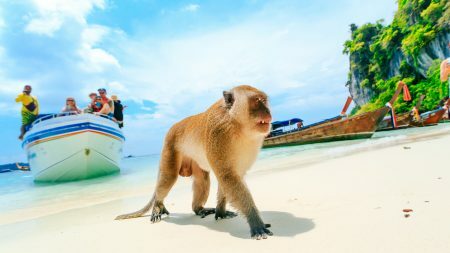 Upon arrival, you will board your ship to visit the thousands of limestone islands filled with caves of all shapes and sizes. The sails of junks and sampans gliding along the clear and emerald waters of the bay form a magnificent scene that blends into the sky. 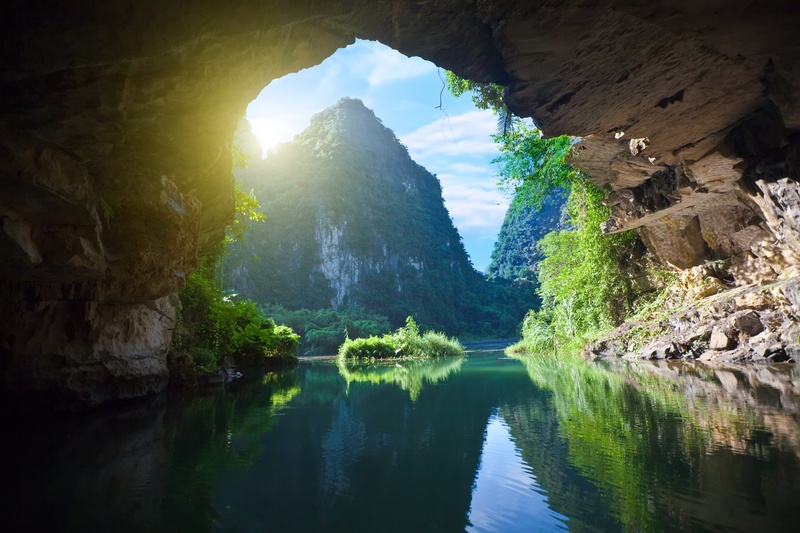 You will also have the opportunity to visit some of the hidden grottoes beneath the towering cliffs. Enjoy sunset cocktail to unwind followed by a delicious fresh seafood dinner. 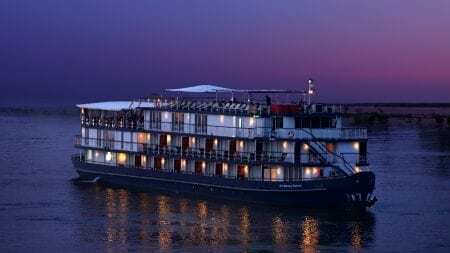 Stay overnight onboard the luxury cruise. 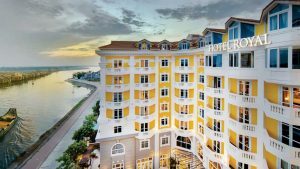 Accommodation: Overnight Cruise in Halong. Awake early and participate in Tai Chi on the top deck or simply relax and enjoy the sunrise over the bay’s towering islands, a sight not to be missed! Enjoy a morning cup of coffee or tea, before setting out to explore nearby islands by rowboat. 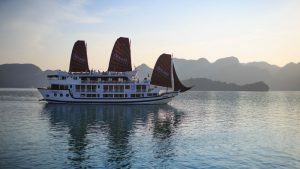 Return to the junk for breakfast then take advantage of the sundeck and admire the amazing rock formations of Halong Bay. Enjoy a light lunch before heading back to shore. Your driver will then meet you at the Halong jetty for your drive straight to Hanoi.airport to catch up the internal flight to Da Nang. On arrival there, you’ll be met and transferred by another local guide to Hoi An to check in hotel. Free time afterwards. 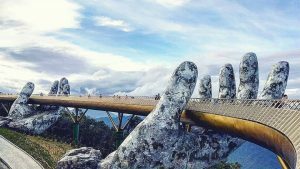 Central Vietnam attracts travellers from all over the world not only by its natural landscape but also by its manmade records. 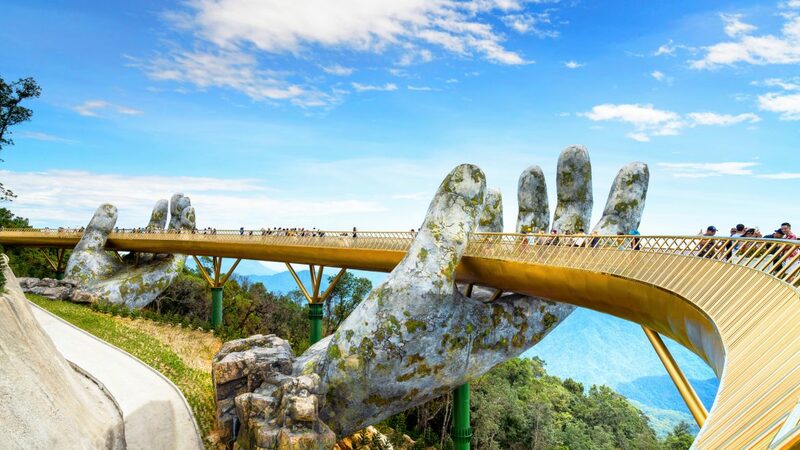 This morning, we’ll travel for the newly open and viral Golden Bridge. Once we get the Ba Na mountain foot, we’ll travel by cable car up to the Marseille station. 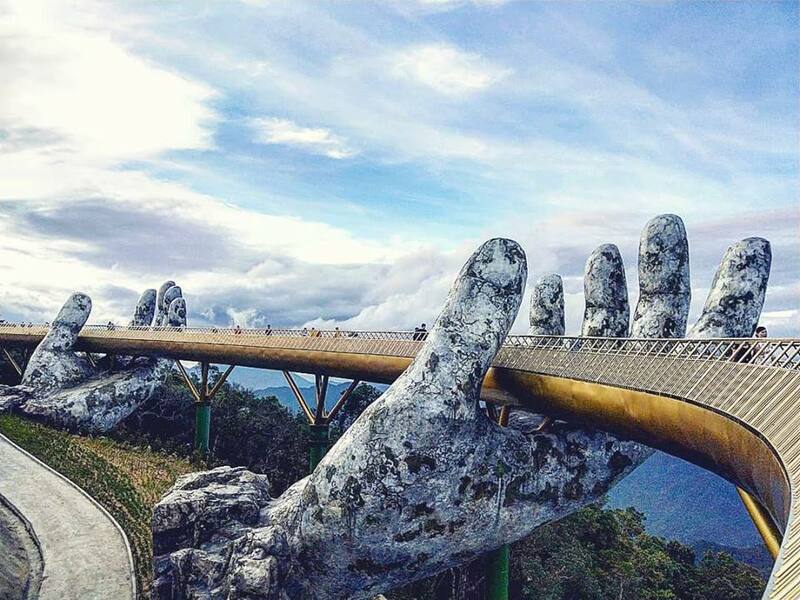 Get out and take a short walk to the Golden Bridge– a break point of the trip- to feel like walking on the clouds. Just newly opened to the public in early June 2018, the bridge which was built in the midst of the forest stands out in yellow. 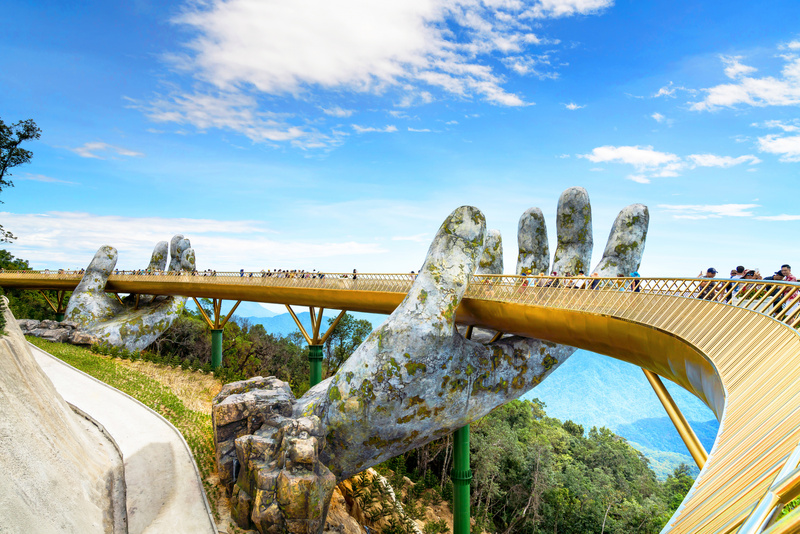 Noteworthy, this unique architecture with the bridge image supported by grey hands, creates a beautiful scenery surprised. Time for taking photos and enjoying the easy breeze, breathtaking view and afterwards, we’ll walk further to a romantic flower garden – Le Jardin D’Amour. The 9 gardens are 9 interesting stories in 9 unique architectural styles. These create a poetic and colourful space. Next, walk to visit Linh Ung Pagoda to admire its sophisticated architecture together with 27m high Shakyamuni statue which brings us peaceful feeling as visiting this place. Have a delicious lunch before catching the cable car downhill and then transfer back to Hoi An. Later this afternoon when the day heat stops, enjoy Hoi An Walking Tour followed by a sunset cruise along the romantic Thu Bon River – a nice way to unwind! Today is an easy day for you to spend the way you want. 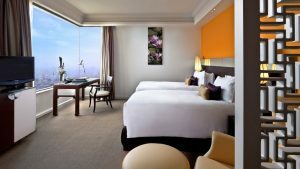 Perhaps, you just relax by the beach/swimming pool or sign up one of the following included tours to enhance your holiday. Start your Hoi An cooking class with a special signature welcome drink. Stroll throughout the local market where you’ll learn more about the ingredients that the local people prepare their daily meals. Then, in class, put your hand in and cook your own dish. You will take the theory and do a demonstration for the first two courses. Then you cook by yourself under the chef’s observation. You will then have time to sample your efforts. 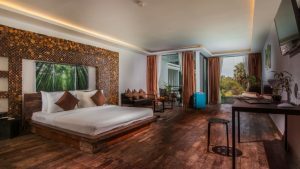 Tra Que is a charming petite village located just a few kilometres from Hoi An. 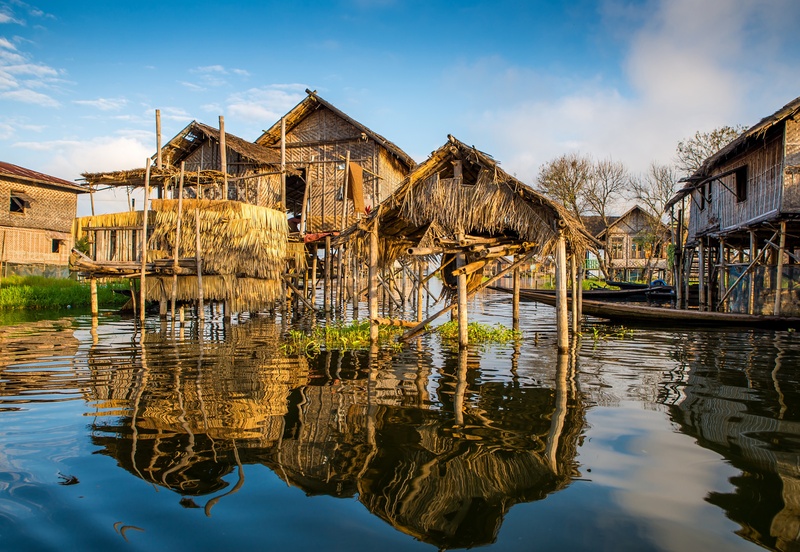 The village is named after the sweet scented vegetables Hoianese grown in the village, which are used to spice up famous Hoianese delicacies. Depart from your hotel either by private car or bicycle. Stroll through the atmospheric Tra Que Vegetable Village to observe and try the local farming activities. Learn the process of planting vegetable: raking the ground, sowing, watering and picking vegetables. After the farm trip, you will see how good Vietnamese is with ‘Banh Xeo’ (sizzling cake). This Vietnamese savoury pancake is popular and favoured throughout Vietnam. Finish with a visit to the local market. A light meal will be served during the tour time. This tour offers a great way to discover the countryside up- close. 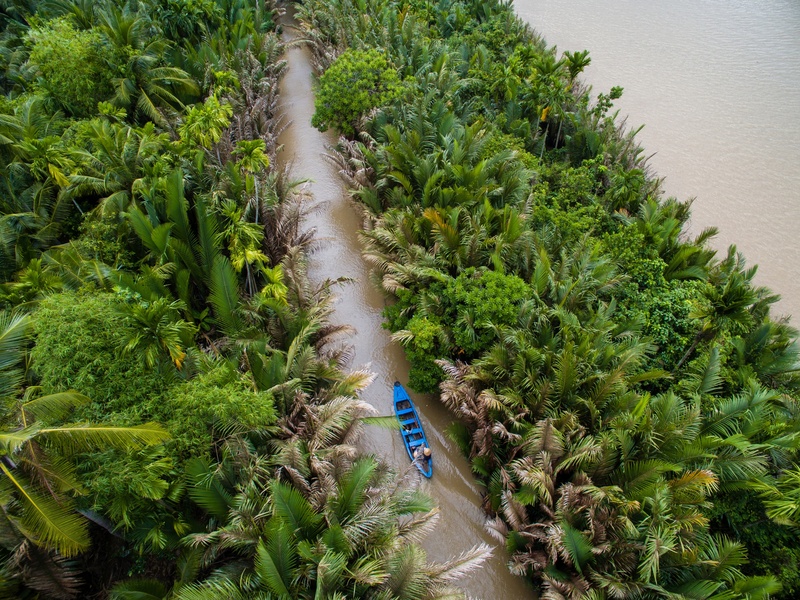 Cruise along the canals by bamboo basket boat while meeting with the hospitable fishermen and learning from them how to fish the local way. 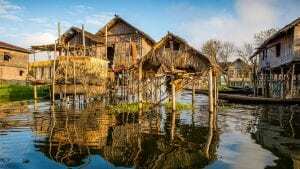 Then, walk through the green coconut village, see and learn about the unique thatched houses made of palm leaves. There is a lot of photo opportunities along the way to help you record the trip. Lunch is also included on the tour. Tonight, we’ll have a gourmet dinner at Brother’s Café, a charming riverside restaurant. 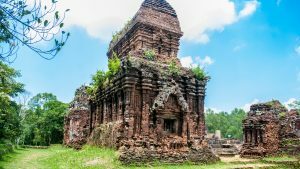 Following breakfast, check out the hotel and depart Hoi An for My Son Sanctuary, a great sample of ancient Champa civilization. Being nestled in the tropical jungle, the whole complex stands astounded by a great number of exquisite stone sculptures, temples and towers. Afterwards, travel back to Da Nang where we’ll have a fresh seafood lunch at a local restaurant by the sandy beach. This afternoon, take a short flight to Saigon. 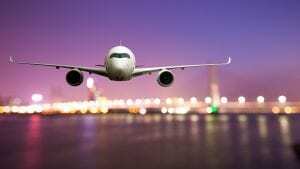 After landing off, you’ll be met and transferred to check in hotel. This evening is free. After breakfast, transfer to Cu Chi Tunnels. 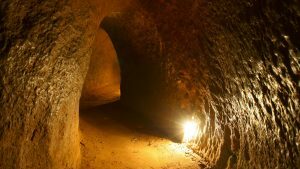 During the Vietnam War, guerrilla fighters built a labyrinth of narrow tunnels, using them to hide in during bombing raids and to stage surprise attacks. 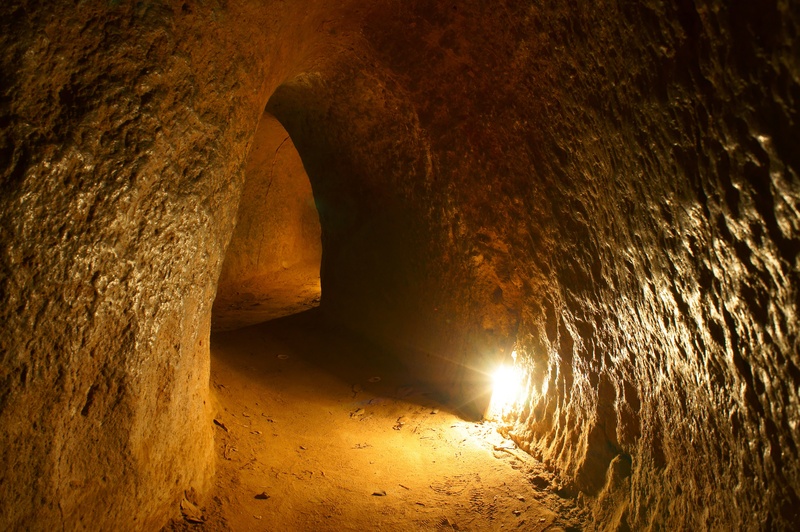 Today, the remaining tunnels have become a major tourist attraction, giving visitors a unique understanding of what life was like during the Vietnam War. After having lunch at a local restaurant we’ll find the way back to Saigon and enjoy the remainder of the day at leisure. 1. Dinner on Saigon River Cruise. 2. Dinner in the restaurant which was once the residence of the last president of southern Vietnam. 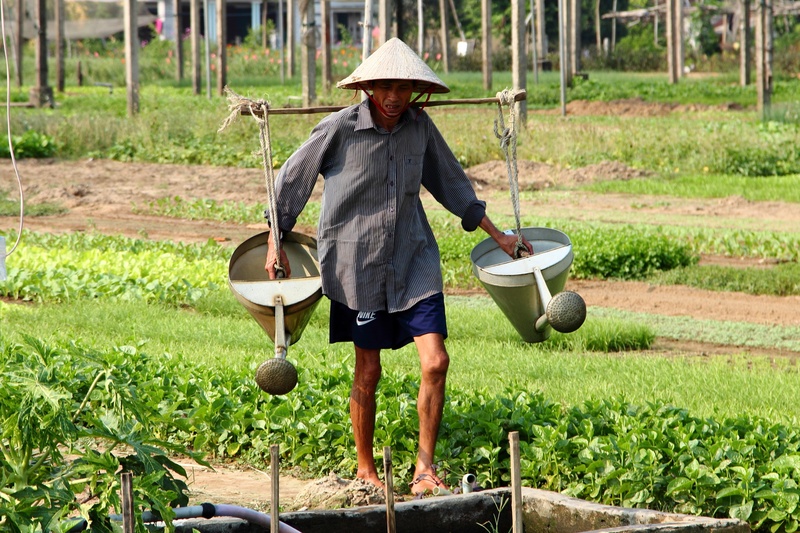 Travel to Ben Tre to discover the unique lifestyle of inhabitants living along the Mekong Delta. Board your cruise on Ben Tre River (one of the tributaries of Mekong River) before stopping at brickworks to see how bricks are made in traditional style by printing and baking. Next, visit a coconut processing workshop located along the canal. Turn on natural scissors creeks where they look smaller and smaller which will lead to a local village. Walk to a family workshop to observe sleep mats being made while enjoying some fruits and tea. 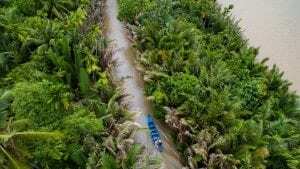 Then you’ll take a motorized cart or cycle under shady trees, pass by green rice fields and vegetable plains all while getting a feel for the life and tropical culture from Peasants. Lunch is served at a riverside restaurant. 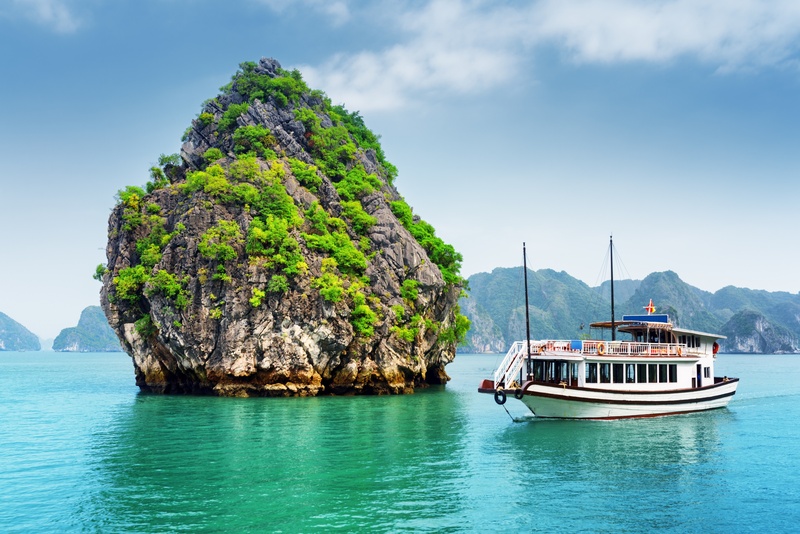 In the afternoon, you’ll take a row-boat along water palm creek and then boat back to Hung Vuong Pier, where your transport is waiting back to Ho Chi Minh City. 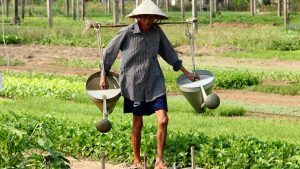 Lunch will be included on your Mekong Delta tour. 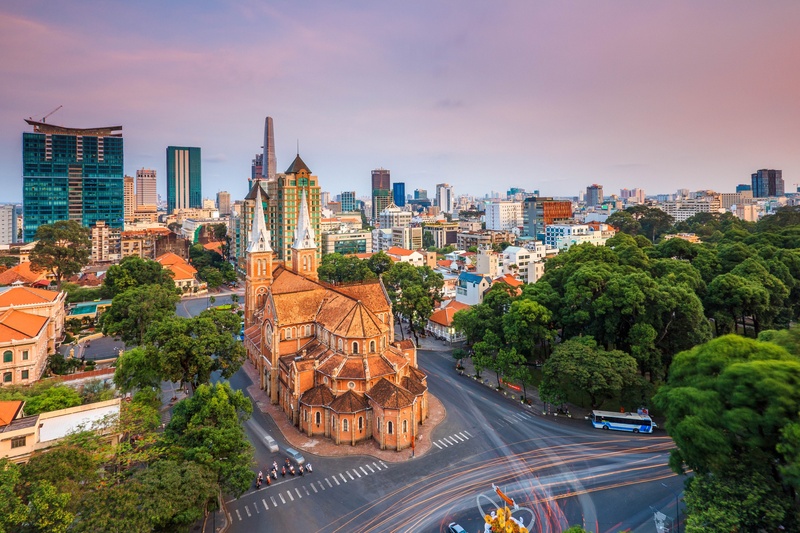 Following breakfast, late check- out of the hotel and you will have a half day tour of Ho Chi Minh City with highlights such as Notre Dame Cathedral, Post Office, War Remnant Museum and soaking up the atmosphere at Ben Thanh Market, one of Ho Chi Minh’s liveliest areas. Have Pho for your lunch today in Saigon. 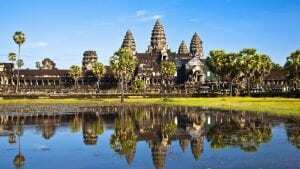 In the afternoon, we’ll catch a flight to Siem Reap, gateways to Angkor Temples. After landing off, you’ll be welcomed by a local guide and transferred to the hotel to check in and enjoy free time then. Tonight, choose where what you want to dine. The restaurant list includes the authentic Khmer Champey and Siem Reap FCC which is fusion. 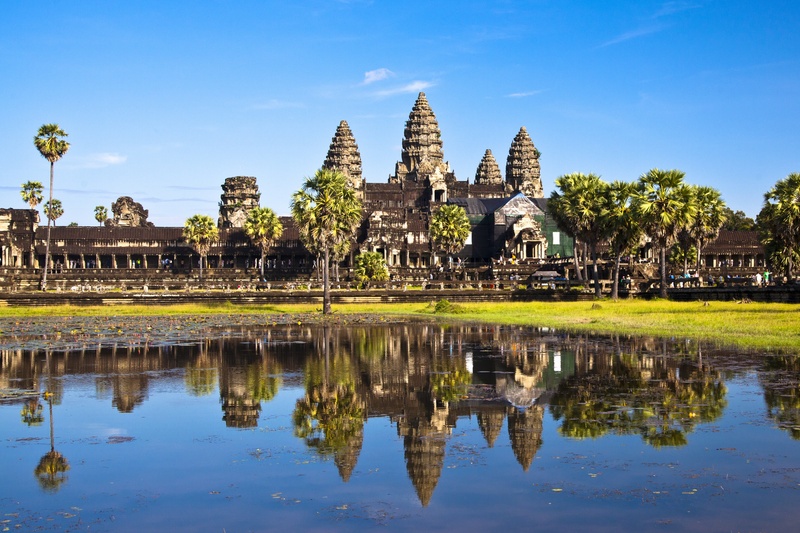 Rise up early today when it’s cooler and less crowded to see the mystical Angkor Wat at dawn. The special tour is arranged with a private table, tea, coffee, snack… inside the temple site for your best enjoyment. Later, back to the hotel where you will have breakfast and relax then. Farewell dinner tonight at a local restaurant with Apsara dance. 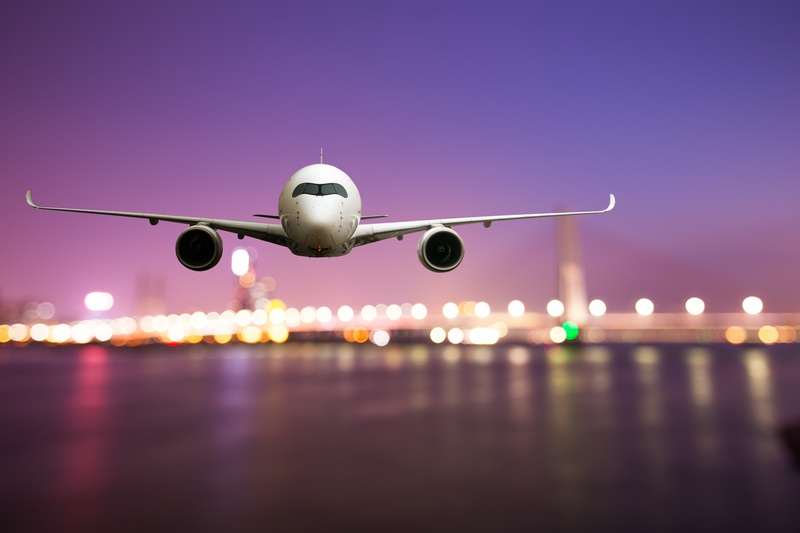 This morning you will have some free time for any last minute sightseeing or souvenir shopping before your transfer to the airport for your flight home.